Captain Rick's Sportfishing Center. 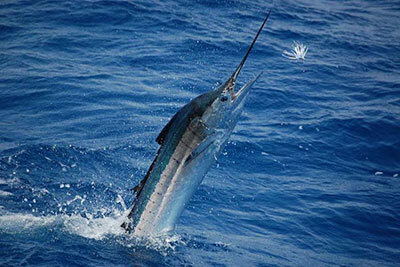 The Absolute Best Sportsfishing in the Riviera Maya! Serving Playa del Carmen, Puerto Aventuras, Akumal, Tulum, Puerto Moreles, Cozumel and Cancun. 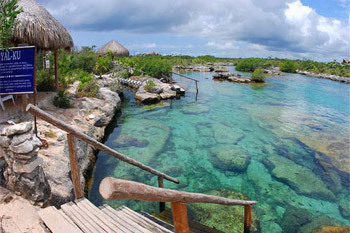 Yalku Lagoon is one of the most popular destinations in Akumal. This Caribbean inlet is filled with underwater sea life; every nook has something new and colorful to offer. It is like snorkeling/diving in an aquarium, great for small kids, especially if the surf is up on the bays. There is a small entrance fee to the Lagoon (as of this writing it is 150 pesos), unless you rent a lagoon-front property. There is a parking lot, paths with a few stairways for entering the water and bathrooms. Mixture of spring fed fresh water mixed with ocean salt water. Sturdy footwear and towels are a nice thing to have here, as there is not a beach entrance, just limestone terraces. There also is a small cafe style restaurant offering burgers, tacos and cold beverages. Snorkel equipment available for rental. Left past the arch at the entrance to Akumal. 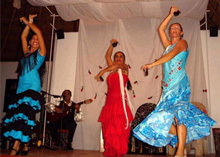 The fine dining restaurant of Lol Ha offers Mexican Folkloric Dancing Shows. See and hear the beautiful dancing, costumes, music and footsteps of these talented dancers. Check with the restaurant (Phone: (52) 984-875-9014) for the current schedule, as this program is only offered a few times a week. Lol Ha is located on the beach at Akumal Bay, to the right of the arch. Also enjoy their beautiful veranda with a view of the ocean and exceptional cuisine. Half Moon Bay is a wonderful place to snorkel with the turtles, rays, tropical fish and coral stags. Or, to start your day right, wake up early for a stunning sunrise. There are a few local restaurants on this beach where you can dig your feet in the sand. Mixture of fine sand changing to rocks at the waters edge. Footwear recommended for water entry. Dive shop with snorkel equipment for rental. Left past the arch at the entrance to Akumal. Akumal Bay is a fantastic beach for swimming and snorkeling. Central to many restaurants, gift shops, galleries, marketplaces, kids club, laundry, library, police, restrooms, spa, ice cream, stage area, and more! 2 full service dive shops: Scuba courses, daily reef diving, fishing. Kayaks available for rental. Sailing: Kantaris catamaran at Akumal Dive Shop. Fine sand beach with sandy entrance at waters edge. Lol-ha restaurant and beach bar with pizza. Shoes not required in most areas. Right past the arch at the entrance to Akumal. Families will love Akumal! There is an excellent turtle watch and release program from May through September in Akumal. Educating our future generations about these endangered creatures is an investment in the future. For more information about Akumal Sea Turtles, please visit http://ceakumal.org/. Mexico's Yucatan Peninsula is filled with amazing locations, wildlife and activities for all types of adventurers, couples and families. Below are links to resources and more information to help make your vacation a fun and wonderful experience.